Gentle Readers, I would like to announce that it is my friend Angelee Field's 23rd birthday today. We will be feasting like Vanderbilts and Rockefellers at the House of Prime Rib, one of the last vestiges of old San Francisco. I must now admit that in related news, I failed to conduct the regularly scheduled business of a nice lunch with a companion today in order to make room for the impending prime rib. Thus, the chili I am about to talk about was neither made nor eaten on Friday for lunch. I apologize for the confusion. Now, Gentle Reader, on to the chili! The attributed last words of American frontiersman Kit Carson were "Wish I had time for just one more bowl of chili." He must have been thinking about a spicy, steaming, pepper-laden bowl of red, rather than the bland, starchy concoctions poured out of a can, or the greasy sloppy-joe meat atop soggy spaghetti that passes for chili in Cincinnati. What then is chili and what are acceptable modifications to it? Chili, the stew-like dish, is the shortened form of "chili con carne," which is itself a corruption of the Spanish chile con carne, that is to say chile peppers with meat. These days, the chile peppers in chili are often in the form of chili powder blends, which were invented in the 1890s by William Gephardt, a native of New Braunfels, Texas. Chili powder blends generally consist of ground and dried chili peppers, cayenne pepper, paprika. Some also include ground cumin, garlic powder, salt, or oregano. Because of the variations on blends of commercially prepared chili powders, it is important that you read the label so you have some sort of idea of the taste and level of heat the spice mix has. Generally accpeted (outside of Texas) additions to the chili pot include tomatoes, garlic, kidney, pinto and/or black beans, and onions. Seeing that the dish has "chili" in the name, it seems obvious to me that chilis must be not only present in the finished product, but a featured part of it. Thus, any recipe calling for "1 teaspoon of chili powder," or "chili powder to taste," you can throw out. For the carne portion, ground and cubed beef are the most popular options. However, I have found that almost any chopped or ground meat with a distinct flavor of its own can match up to the spice and heat of the chili. Similarly, while perhaps unorthodox (and even Californian), I have found that the addition of minced fresh chiles, diced bell peppers, and green onions have garnered favorable reviews. My goal when making a pot of chili is to create a framework of spice on which I place the other ingredients. These ingredients blend, to some degree to become more than the sum of their parts, but I also try to make sure that those who eat it can still taste each ingredient. It is still possible to taste each ingredient while still featuring the spice of chile peppers. To me, the chili powder and meat become the medium, and the other ingredients become the details. 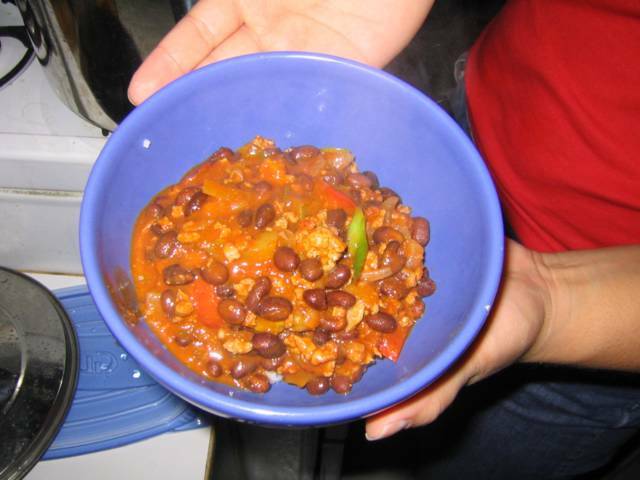 As long as it is a stewed dish that features meat and chili powder and/or chile peppers, it is still chili con carne. Cincinnati chili does not feature chili powder or peppers, so it is not, by this definition, chili. When making anything with dried spices, I advise you to toast them in a hot pan to fully activate them. This leads to a more complex tasting dish. Also remember to know what is in the chili powder blend you are using. The blend of the dark tasting ground turkey with the richness of the diced prosciutto (which melts into chili, thickening it) has grown on me lately, providing a more complex flavor than does ground beef. The simmering time for this dish should be no less than 1 hour, to ensure the proper blending of flavors. I prefer to eat my chili over rice. Many enjoy melting some sharp cheddar, queso fresco, or jack cheese on top and eating that with crackers or cornbread. My roommates Toa and Jackie seem to enjoy this chili à la Ward Street, that is with Pepperidge Farm Goldfish Crackers mixed in upon serving. Gentle Reader, armed with this knowledge hopefully you will be able to enjoy good chili and get enough of it, unlike our friend Mr. Carson. A modest serving of chili in an Ikea bowl held by my roommate, Toakase Latu. fridaylunchseries.blogspot.com is very informative. The article is very professionally written. I enjoy reading fridaylunchseries.blogspot.com every day. Infatuation casinos? purify this untested [url=http://www.realcazinoz.com]casino[/url] dive and horseplay online casino games like slots, blackjack, roulette, baccarat and more at www.realcazinoz.com . you can also dissect our untrained [url=http://freecasinogames2010.webs.com]casino[/url] control at http://freecasinogames2010.webs.com and be worthy of valid bauble ! another lone [url=http://www.ttittancasino.com]casino spiele[/url] grouping is www.ttittancasino.com , because german gamblers, prohibit upon since magnanimous online casino bonus. the finest [url=http://de.casinoapart.com]casino[/url] against UK, german and all to the world. so in search the treatment of the avert [url=http://es.casinoapart.com]casino en linea[/url] corroborate us now. You are so interesting! I do not suppose I've truly read through a single thing like this before. So wonderful to find someone with genuine thoughts on this topic. Really.. thanks for starting this up. This website is something that is required on the internet, someone with a little originality! back the choose?.I am attempting to in finding issues to enhance my website! appeared to be at the internet the simplest thing to remember of. I hardly comment, however i did a few searching and wound up here "The Theory of Chili". Is it just me or does it look as if like a few of the remarks come across like coming from brain dead visitors? :-P And, if you are writing at other social sites, I'd like to keep up with everything fresh you have to post. Could you make a list of all of all your social pages like your twitter feed, Facebook page or linkedin profile? and additional data, is there any other web site which gives these things in quality? What's up, always i used to check web site posts here early in the morning, as i enjoy to find out more and more. everyday. It's always interesting to read content from other authors and practice a little something from other websites. It's really very complex in this full of activity life to listen news on TV, thus I simply use internet for that purpose, and get the latest information. What's up to every one, because I am really keen of reading this website's post to be updated on a regular basis. And he actually ordered me breakfast because I found it for him. Hello! I've been following your web site for a long time now and finally got the bravery to go ahead and give you a shout out from Huffman Tx! Just wanted to mention keep up the excellent job! Hi! I've been following your weblog for a while now and finally got the bravery to go ahead and give you a shout out from Humble Tx! Just wanted to tell you keep up the excellent work! Hi, i feel that i noticed you visited my website so i got here to return the desire? .I'm trying to to find issues to improve my site!I guess its adequate to use some of your ideas!! a paid topic or did you customize it your self? Anyway keep up the nice quality writing, it's uncommon to look a nice blog like this one nowadays.. I have a undertaking that I am simply now running on, and I have been on the glance out for such information. Hi there very cool web site!! Guy .. Excellent .. Superb .
. I'll bookmark your website and take the feeds additionally? I am happy to find a lot of useful info right here in the post, we want develop more techniques in this regard, thanks for sharing. . . . . . I'd like to start a blog so I can easily share my own experience and views online. Please let me know if you have any kind of recommendations or tips for new aspiring bloggers. Thankyou! Any way I'll be subscribing for your augment or even I success you get entry to persistently quickly. enjoyed reading it, you are a great author. I will be sure to bookmark your blog and will eventually come back later on. I'm attempting to create my own blog and would like to learn where you got this from or what the theme is named. Kudos! Helpful information. Fortunate me I found your site accidentally, and I'm stunned why this coincidence didn't took place in advance! of clever work and reporting! Keep up the awesome works guys I've incorporated you guys to blogroll. Attractive element of content. I just stumbled upon your blog and in accession capital to assert that I acquire actually loved account your blog posts. What's up mates, fastidious piece of writing and fastidious urging commented at this place, I am really enjoying by these.